Dubai: Backbreaking would be an understatement to describe the obstacles that participants at the Gov Games will have to overcome to lay their hands on the coveted Dh1 million prize this Saturday. 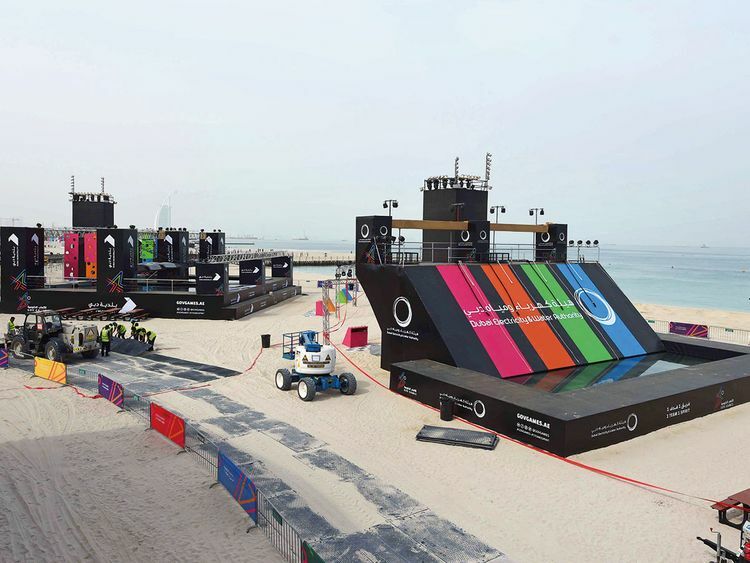 Beginning at Jumeirah’s Kite Beach on Wednesday, the four-day event open to both UAE-based and foreign government departments will see 62 female teams and 106 male teams, including 15 teams from nine countries, competing to qualify for the final round that will be held on Saturday. Last year, a team led by Shaikh Hamdan Bin Mohammad Bin Rashid Al Maktoum, Crown Prince of Dubai, came from behind to win the title in the male category. The opening day will see 62 women’s teams competing in heats one and two, including first-time participants and an all-female team from Saudi Arabia. Each team will face eight obstacles, with three winning teams from each heat qualifying for Saturday’s finals. On Thursday and Friday, the 106 male teams will compete in three heats. Each team will face nine obstacles, with two winning teams from each heat qualifying for the finals. Heat one starts at 4pm and heat two starts at 8.15pm on Thursday. Heat three starts at 4pm on Friday. “The second edition of Gov Games has witnessed a strong response from government entities, all of which are eager to leverage the event as an enabler to drive positive change in their work environments,” said Marwan Bin Eisa, director of Gov Games. Time, speed and teamwork determine the sophisticated scoring. Each obstacle is divided into two stages, with each team receiving five points for every stage they complete. In addition, each team member can earn their team a further point if they hit a ‘completion’ button at the finish of each obstacle. “Each course is designed to test the limits of the participants. Like last year, the emphasis of the games will be on teamwork but the obstacles are tougher now. The course will test the capacity of participants in strategising, team work, mental agility, strength and endurance,” added Bin Eisa. Further points are on offer for teams that complete obstacles in less than the 10 minutes’ allotted time, so every millisecond counts for teams. Three obstacles also feature an additional, hard to reach ‘bonus’ button where teams can secure extra points. Teams will have a break of eight minutes between an obstacle of 10 minutes each, to catch their breath and regroup. The obstacles not only test physical strength and endurance of the participants but will also probe skills like balancing and agility as well as the ability to move underwater and work in partnership. The courses will also require the participants to be mentally sharp and calculative while at the same time performing physically. The games are free for the public to enjoy.